Next are our styrofoam spiders. 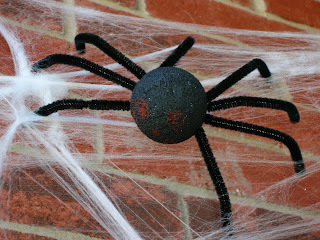 The kids all painted the styrofoam balls black, then we stuck pipe cleaner in as the legs. 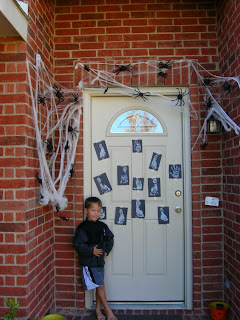 And because we have so many kids, our front door now looks like "Kingdom of the Spiders." Another post? I can't keep up. I love your crafts, especially because they are cute, easy, and shirts and pants are optional. Oh no!! 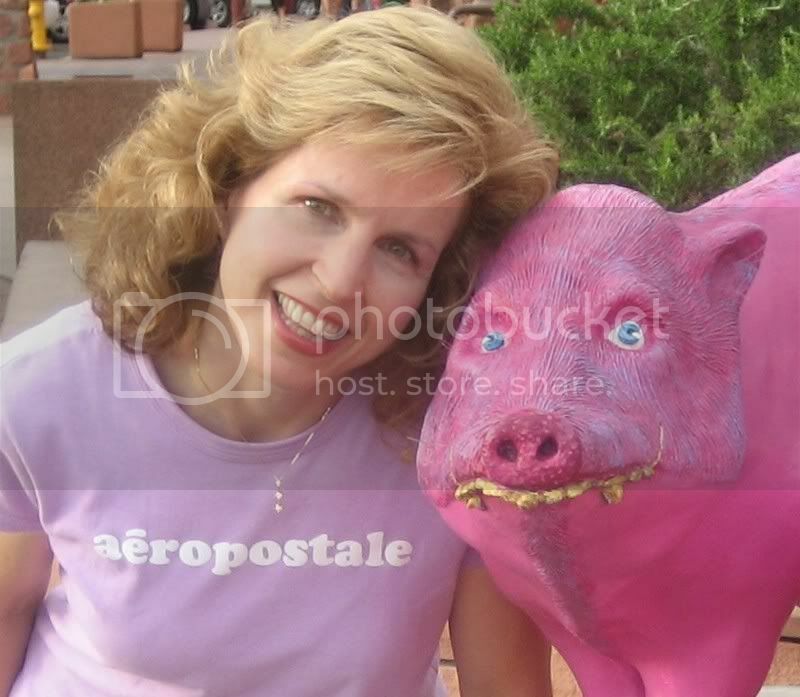 You're one of THOSE moms!! One of THOSE moms! Sigh. I wish. I'm one of the other types of moms. The kind that gets home late in the evening, rushes in after work, de-freezes something from a package for dinner, spends about 2 hours with the kids in the evening, all the while thinking about how messy the house is and then, once they're finally in bed... instead of cleaning the house or making home made banana bread or something, I plop on the couch with ice cream and turn on the TV. I looooove your spooky decorations you guys made. 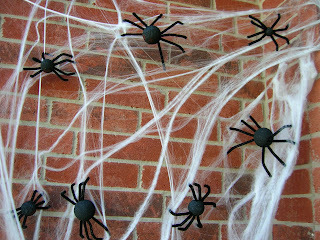 I want to make some styrofoam spiders! Did you just use styrofoam balls and pipecleaners? I like the decorations! But don't you let your kids wear clothes? Is this how the 18th and 19th kids get treated? Love the decorations--too cute. And you say you are not crafty--SURE YOU'RE NOT!!!! Looks crafty by my book. I buy all my crafty stuff at Roberts, but it's already made crafty for me. America's most Haunted live last weekend. 'Twas cool. I love how your front door looks. Freaky spiders. Woo-ooo-ooo. Livie looks comfy to me. Isn't that the criteria for getting dressed? 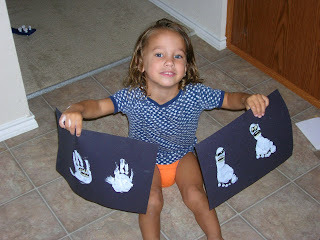 what a great idea oh my gosh...i just thought to myself as i was reading your post that doing hands and feet prints is a great way to see how fast they grow over the years. Do you keep those or throw them out after halloween? 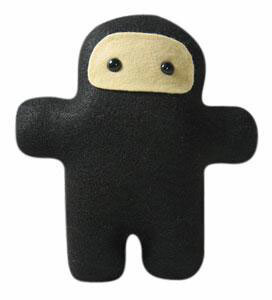 The crafts are so cute! 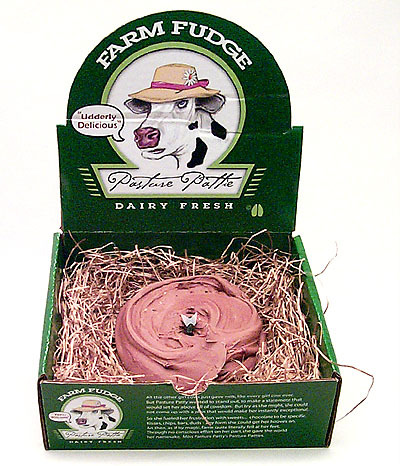 I've been looking for an easy and unexpensive craft to do with the kids. I love Ghost Hunters! but I don't dare watch it when Jared is out of town. Do you watch it alone? I can't even watch scary movie commercials when he's not home. 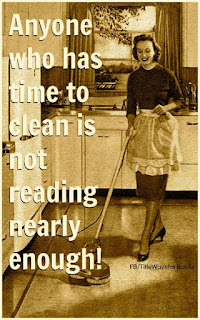 I won't judge you if you're crafty. Clothing optional crafting just makes cleanup easier. You know it's Fall when I break out my festive pumpking wreath that I bought at the Dollar Store years ago. So, hands can make turkeys and ghosts? Who knew that having hands could be so practical? Cute decor! I have a door cover that I bought from Wal-Mart with a ghost on it. Yeah,your front door looks lots better than mine. I am cracking up at homeboy! NO silly saturday NO SEI saturday. I am going to bed and just going to hope for a better tomorrow. 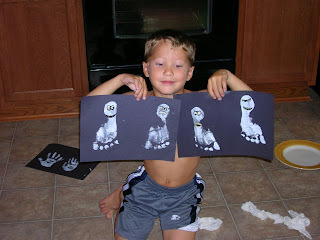 I love the idea of making ghosts with your hand/feet prints!!! Cute!!! Torantula is like a combination of you and me. Minus the hairy, black, and actually being a spider part. Me likey the decorations. I don't even really bother to get crafty. What I normally do is buy a prefab thing...supah cheap. "I am just feeling extra post-ie lately"
Send me some of those postie energy vibes!! Twin Power, engage!